Proper use of grammar is important. That is not to say I agree with nitpicking and embarrassing others publicly, but there are some mistakes that should not be made. Disclaimer: I am not a member of the Grammar Police, but some have thought otherwise. Let's just say I am a stickler for grammar, but I also do know when it may be appropriate to bend the rules. That being said, there are grammar mistakes that simply make me cringe. Whether in embarrassment for the writer or in frustration, I cannot really say. But, writers, pay attention. The grammar points I am about to highlight may be my pet peeves, but make no mistake about it: if you make these mistakes in your work, you just might lose the respect of your peers and readers. Would you want that? This is one of the foundations of the English language. The subject and the verb must always agree. Singular subjects require singular verbs. My boss is the kindest person I know. "Boss" is singular. Thus, it requires the singular form of the verb "to be". Plural subjects require plural verbs. My cousins are the best friends one can ever ask for. "Cousins" is plural. Thus, it requires the plural form of the verb "to be". These examples are rather simplistic, I know, but mastery of the basics is necessary. Subject-verb agreement can get complicated, but for the most part, that is not the case. The important thing is that you follow the rules, and never write such things as "You was so irritating!" I know Bon Jovi isn't exactly the coolest band to refer to these days, but I have to admit that their music is one of my guilty pleasures. If you feel the same, you might recognize these lyrics. "If I was your mother..."
Do you notice anything wrong with that phrase? You might have heard of the second conditional, a structure used for possibilities that are unreal - for dreams and wishes. The form of the second conditional is illustrated by the simple chart below. So, this form is used when talking about things that would probably never happen. Just like in Bon Jovi's song, him being his the mother of his girl is not possible, hence, instead of "was", the verb should be "were". Facebook and Twitter have exposed us to this mistake so much that some might have gotten used to it. NOT! It's really simple. "You're" is a contraction of "you are". "Your" is a possessive pronoun. This is another very common mistake and the explanation for proper use is rather similar to the explanation above. When your fingers are flying fast across your keyboard, stop for a second and think if you mean "it is" or "its". 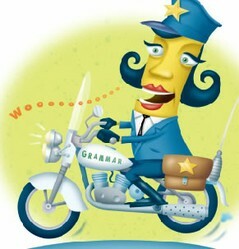 One of my favorite grammar jokes is where a grammar nazi is being comforted by someone who says "Their. They're. There." - complete with pats on the back. Seriously, though, this mistake is made so often and yet it's still irritating. For writers, it is a non-negotiable! Bottom line though: these are usually typos for writers. A mistake can be forgivable as long as it is caught by proofreading, don't you agree? Which irks you the most? Learn about writing from Harvard! The misuse of to and too makes me nuts for some reason! Me vs. I - Which One When? He and I ... her and me ... How about a simple grammatical rule for when to say "I" or "me"?